The quality of your education is important to you and to Kellogg Community College. At KCC, we engage in a variety of activities to ensure that we are meeting your needs by providing the best instruction possible. One of the methods we use for continuous improvement is student evaluation of instruction surveys. Each semester a variety of courses are selected to receive student feedback. This is your opportunity to reflect on your learning experiences and tell us what works best for you. 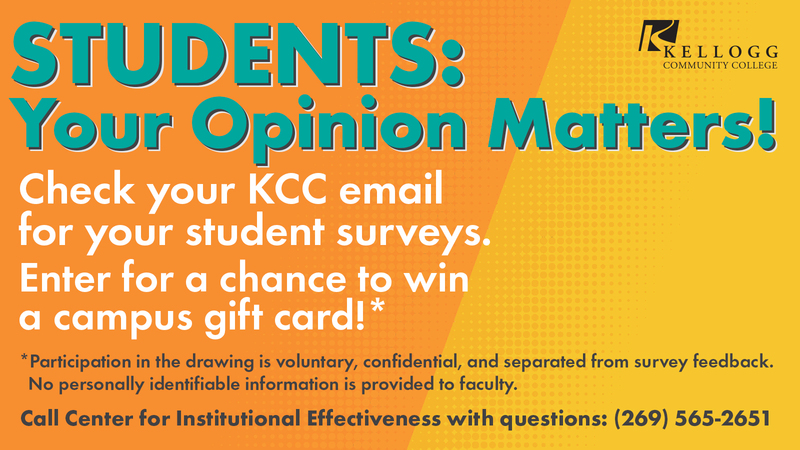 If you have technical difficulties completing the survey, please contact Karel Asbury in the Center for Institutional Effectiveness at 269-565-2651.